A one-pot wonder for a Friday night in with your buddies! Preheat the oven to 160oC/gas mark 3. Warm the oil in a flameproof casserole set over a low heat. Add the carrots and onions and cook for 5 minutes, stirring occasionally, until soft. Remove the vegetables from the casserole with a slotted spoon and set aside. Place the flour in a large freezer bag and season with salt and pepper. Add the stewing steak to the bag and shake well to coat. Do this in batches if necessary. Add the stewing steak to the casserole in batches so that you don't crowd the pan and cook, stirring frequently, until browned all over. Return all the meat and the carrots and onions to the casserole and sprinkle over any remaining flour from the freezer bag. Pour in the stout and add the brown sugar, thyme and bay leaves. Bring to the boil, then cover with a lid and transfer to the oven to cook for 1 hour. Meanwhile, to make the herb dumplings, sift the flour and salt into a bowl, then stir in the butter and parsley. Add just enough of the water to make a soft dough. Shape into balls in the palms of your hands. Remove the casserole from the oven, fish out the bay leaves and discard them. 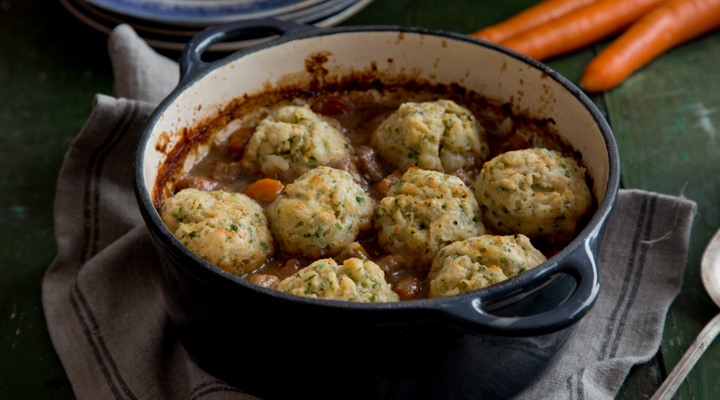 Arrange the dumplings on top of the casserole, then return to the oven and cook for 30 minutes more.